Facebook has proven to be a great avenue for advertising. If you like a person, place, or thing — a not just a catch-all noun — you may find a posting on your wall that will raise your antennae. During one of the hot spells Chicago was experiencing, there was an advertisement from a restaurant that I had gone to for brunch a year ago. There was a set of martinis, all looking so refreshing, so inviting, so in need of being imbibed. Me not being a prude quickly blocked my calendar and prompted one of my friends to let her know that I was going to Club Lucky at 1824 W. Wabansia Avenue in Chicago’s Wicker Park for some liquid happiness. 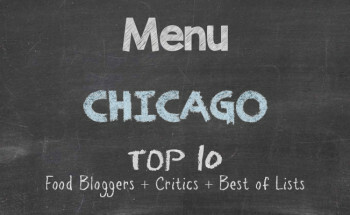 Not immediately off the main Milwaukee-North-Damen intersection where there is constant energy all around the clock, but rather down the street in the midst of a residential area, there were outdoor seating to be had, martinis to be turned up, and food to be devoured. All aboard the Blue Line, which is one of the busiest train lines in the city due to its run out to O’Hare Airport and through trendy neighbourhoods Wicker Park, Bucktown, and Logan Square. My friend and I squeezed on at the Clark and Lake subway stop with a host of suits, ties, skater boys, gothic chicks, and growling bellies. It was off to Club Lucky to see if those drinks they make on site had the same appeal as the ones in their Facebook advertisement. 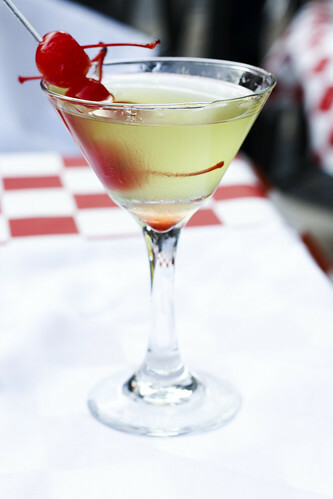 With a basket of warm homemade bread at our disposal and the setting sun allowing a bit of a cool breeze to blow about, instead of the muggy heat we had been having, we ordered a lemon drop martini apiece. Insert sound byte of a spring popping. Those martinis were loaded. Well, actually, they were not. The bartender had prepared them such that the lemony accent took centre stage, which allowed the vodka to creep up on us. When my friend started smiling excessively, I knew that she had started hovering just about an inch or two above ground. We then decided that it was better to savour the martinis and gobble more bread and drink more water, lest we stumble about like the trashy students at Oxford on Thursday nights. Having gone for brunch, I was already aware that Club Lucky has a way in the kitchen that results in something incredibly tasty coming to the table. The thing is you can never really judge dinner fare by breakfast or brunch. Yes, I have gone to a few restaurants where the brunch menus were, as the current hip-hop generation says, off the chain. The dinner servings were worthy for the floor, I must say. 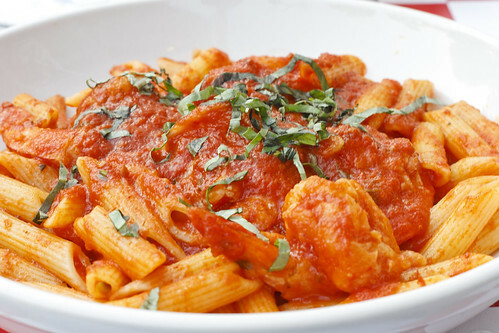 But you cannot go wrong with Italian dinners unless the chef is mixing some Chef-Boy-Ardee into the recipes. Seeing that Club Lucky is not rustic, in that they are heavy on red and cream sauces, we chose our orders — my friend based on a recommendation from the waiter and me knowing what I wanted. And we sat and waited while our orders were prepared. 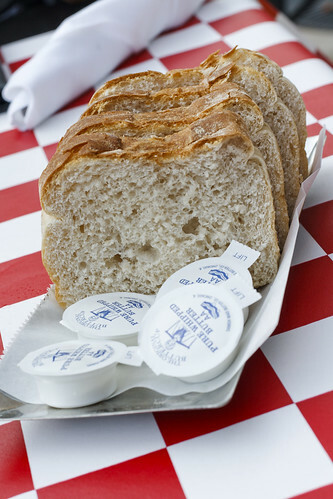 More bread to the table and more water poured into our glasses, we waited more, which gave us the feeling that nothing was heated quickly, styled on plates, and rushed to the tables. Happiness abounded. My dining companion ordered chicken and herb tortellini. 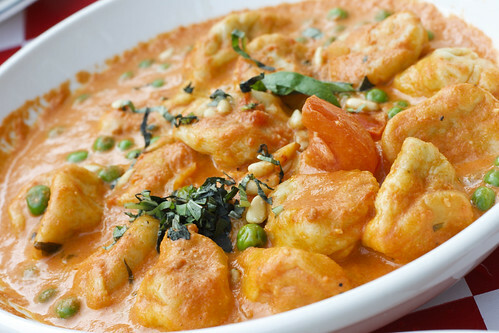 These chicken and herb filled tortellinis with English peas and pine nuts in homemade vodka sauce were like sirens. They sang, begged, and lured us with each bite. Granted there were no rocks for us to smash against, but we literally were crashing against virtual stones, splashing about, and smiling foolish smiles all the same. The creamy vodka sauce, although not potent enough to make us drunk, was a nice complement to the heavy-laden martinis that kept raising us out of our seats a few inches per swallow. But the last time I had tortellinis in a creamy vodka sauce worthy of raving about was at a certain Italian restaurant in Lincoln Square that another friend and I had gone to for celebration when we both had moved away from an apartment complex on the South Side that had been taken over with drugs, prostitution, and gun play. Just like that the Lincoln Square restaurant, the preparation at Club Lucky added a bloom to the taste, as the spices worked together to give a pop to the dish. Being a lover of spicy food, I ordered a shrimp arrabiata. Thinking that the chicken and herb tortellinis were a great hit, the arrabiata was worth standing on the table and dancing. Perhaps standing on the table, and me not being a stunt man, would not be the best thing to do. Clapping my hand, stomping my feet, singing a song, or even throwing the plate on the ground — after I had finished all of the arrabiata — would be a better option. Plump shrimp that exploded with flavour and al dente pasta under a tangy and spicy red tomato sauce were all that I needed on this particular evening of cicadas making noise in the background, a beautiful sunset, great company, and yet another martini that by now had me flying across the sky in an invisible jet. Oh, and not that it really matters, but cilantro goes with everything. Added as an accent to the arrabiata, I made a mental note again to carve a wooden hand for clapping anyone across the cheeks who boasts that they prepare the best arrabiata in the world. Clearly, they have not been to Club Lucky and had their dishes. By the time we had completed our pasta dishes, several more baskets of bread, and our martinis, we opted to sit for a while before indulging coffee and dessert. 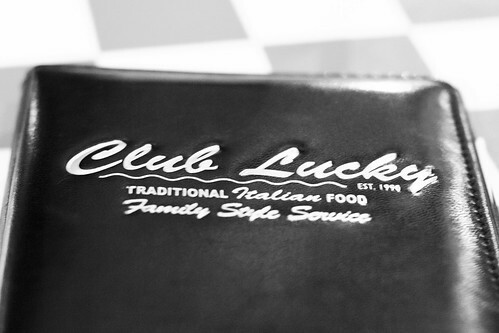 It was clear that while Club Lucky does not have an Italian nomenclature in it moniker, what comes from the kitchen is very much representative of Italy in a genuine sense. So, we felt comfortable with our dessert orders, albeit pedestrian. Cappuccino is rather standard coffee fare on menus at any restaurant you go to and instead of ordering espresso to completely wreck our martini high, it was cappuccino for us. Nothing fancy, nothing special, it was perfect and we drank ours sans sugar. 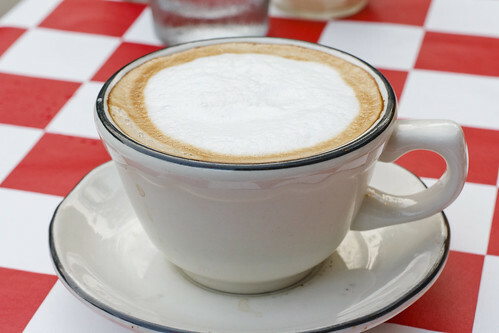 Yes, you know you have a good cup of cappuccino in front of you when you do not need any sweeteners. 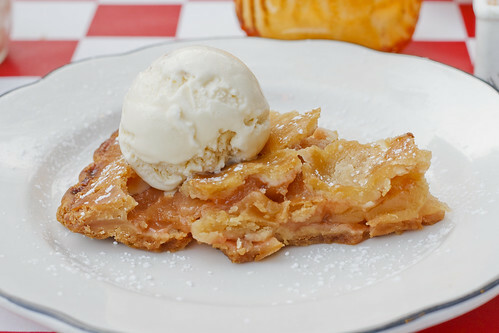 One dessert we had eaten was apple pie with a dollop of vanilla ice cream. Again, nothing spectacular, but certainly not a dessert from the frozen food section at the local market. There were chunks of apples in their natural sauces, not in a compost, which was another indication that the pie did not come from a bakery. I know that may sound like a purist statement, but when the sauce is a jelly, you have a compost from a can. That was not the case at Club Lucky. Okay, so the ice cream was not gelato and it no doubt was a scoop of Breyer’s, the main dessert was the star. But you could almost hear the pie singing to us, “You don’t have to be a star to be in my show.” And then there was the tiramisu. One bite and there was indecisiveness. There was breathlessness. There was a need to fight the urge to moan. Whoever the little Italian woman was in the kitchen who soaked the ladyfingers in rum and whipped up the mascarpone cheese and concocted such an awesome dessert deserves to have her feet washed. 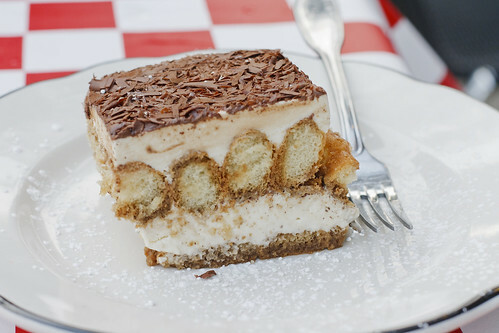 I have seen people get the Holy Spirit in church and I wanted to do my dance while feasting on the tiramisu. By the end of the evening, my friend and I waddled a few blocks away and teetered into a boutique grocery store where I purchased a bottle of wine for later dinners. As to our experience at Club Lucky, anyone with an insatiable appetite and an appreciation for exquisite Italian dining would do well to get his or feet under a table and get sated. Had it not been for the Facebook advertisement of the martinis, which were a blast, who knows what restaurant I would have been at? After an evening of super service, fantastic food, and smile-inducing prices, the only thing that comes to mind is oh how lucky I am to be able to enjoy such bliss.